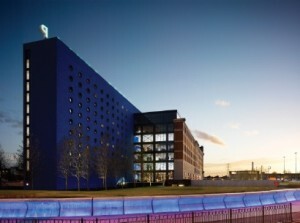 Fort Dunlop stood empty for 25 years until this landmark building, visible from junction 5 on the M6, underwent a massive redevelopment program. Originally designed by Sidney Scott and WW Gibbings in the 1920s as a car tyre warehouse, the building now provides 350,000 sq ft of space. This office refurbishment has a broad commercial offering – Fort Dunlop houses office and retail space, bars, restaurants and a 100 bedroom hotel. The contemporary adaptations include: a circular light driven through the centre of the building from the roof to above the main reception desk; the setting back of the glazing of the external elevations, producing modern office interiors and solar shading; use of the roof space as an informal meeting place; clarity of circulation around the building and the unusual toilet design.